Those are for sure our fingers dug into the soft dough after 1000 hours of the traditional cooking classes But this time I will tell something more about a recipe that is so famous in Dubrovnik in this time of the year. Šporki makaruli or on English Dirty Macaroni is version of pasta with meat. It is influenced by Italian cuisine and has some similarities with Ragu di carne. Dubrovnik aristocrat families used to prepare it every year on Saint Blaise Day, February 3rd. This year it will be 1046 time that we celebrate it and one thing is still constant on our dinner table – šporki makaruli. For the ladies it was very convenient as they were able to prepare meat and sauce one day in advance, go to church on the day of celebration, cook the pasta and serve lots of relatives and friends who visited Dubrovnik on that special day. 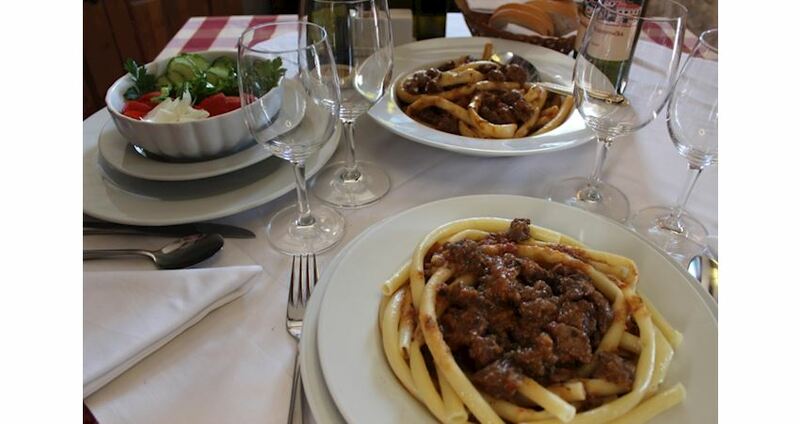 The name of the dish is connected with the fact that you needed to feed many people but there was just enough pieces of beef for few first guests and family members so after almost everything had been eaten the last guests and the servants were offered only pasta and remaining sauce. That's why they mockingly named it dirty macaroni. Here is the original recipe: Šporki Makaruli - Dirty Macaroni For 6 person 1kg of beef ( ideally beef lower leg, diced) 1 kg onions 100 g of pork fat ( or 2 tablespoon of olive oil) 2 cloves of garlic 2 tablespoons of flour 200 g tomato sauce ( puree) 1 tablespoon of sugar 1,5-2 dl red wine ( Plavac Mali) 1 tablespoon of red paprika ½ teaspoon of cinnamon 1 pinch of cloves 1 pinch of ground nutmeg bay leaves parsley salt, pepper goat or sheep cheese ( or parmigianno) for topping Take a large saucepan, put it on the medium heat. Fry finely chopped onions on the pork fat or olive oil until it turns golden. Chop the meat into cubes (1,5-1,5 cm), sprinkle it with flour and add it to onions. Let it roast slightly from all sides and simmer until the liquid from the meat evaporates completely. Now add the wine and simmer until wine evaporates completely. After that add tomato sauce, paprika, sugar, garlic ( chopped or whole cloves), and other spices ( salt, pepper,cloves, cinammon, nutmeg, bay leave). Stir thoroughly. Cook on a low heat without covering for aproximately 2 – 2,5 hrs adding occasionally some hot water or of you have beef stock ( try the meat, it should be easily divided with the fork ). Before it is ready add some chopped parsley, mix cooked macaroni and leave for 10-15 minutes for all the ingredients blend well. Before serving you can sprinkle it with goat cheese or parmigianno. If you have enough time and good will you can make your own pasta which can't be compared with any bought pasta but in the lack of time you can try with fussili, penne rigate. Homemade macaroni 1/2 kg of plain flour 2 eggs 1 teaspoon of salt Lukewarm water Knead the dough briefly until it becomes smooth. Place it into the plastic food wrap and leave it in a fridge for an hour. Knead firmly and cut into small square pieces, take a big knitting needle ( this was done in Dubrovnik by Franciscan nuns) or clean wooden stick and roll each piece around it into a thin long strip. Leave it to get dry and put it into boiling water for few minutes. They are ready when they come to the surface.